This award winning device monitors energy usage in a domestic shower by measuring water flow and temperature, beeping after a user-preset amount of hot water has been used. The hotter the water and/or the higher the flow, the more energy used, so the sooner the monitor indicates shower-time is over. It displays shower-time left, the current time, and the exact water temperature for precise temperature control. The client came to me with a very clear idea of what was required. My brief was to design the simplest possible package for the electronics and sensors, keeping it strong, waterproof and easy to assemble. A series of metal & plastic prototypes were built & tested in real-world conditions. Further lab testing by the client ironed out any design or assembly issues we could find. 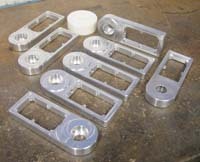 The same CAD solids data used for prototyping was used directly by local toolmakers, where the injection mould-tools and mouldings were produced. Waitek currently manufacture the units in Christchurch, New Zealand, exporting to markets all around the world. Even though the original design intent was to conserve electricity, many users have found it very useful as a water conservation tool, and this feature helped it earn its Australian award.